This category is comprised of special trade contractors primarily engaged in applying plain or ornamental plaster, or in the installation of drywall and insulation. Activities include taping and finishing drywall, applying solar-reflecting insulation film, installing lathing, and constructing ceilings. The U.S. plastering, drywall, acoustical, and insulation industry includes more than 20,000 establishments, according to the latest figures available from the U.S. Census Bureau. Drywall installers, ceiling tile installers, and tapers numbered roughly 176,000 in 2002. 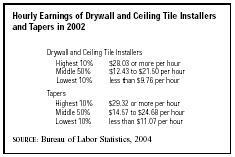 Average hourly earnings for dry wall and ceiling tile installers totaled $16.21, while tapers earned an average of $18.75 per hour. This industry changed markedly in the twentieth century. In the early 1900s most walls and ceilings were constructed with wood lath and plaster. Homeowners commonly performed much of the work themselves. Thermal and acoustical insulation, if any, generally consisted of natural materials. After World War II, gypsum wallboard began to displace the lath and plaster, and various synthetic insulation products were introduced. New construction materials, along with a massive demand for plaster and insulation during the post-war building boom, created a specialized industry. Because of its heavy dependence on new construction, the industry is cyclical. Commercial and residential construction growth during the mid-1980s generated a steady demand for specialty plaster contractors as gypsum wallboard sales surged past $2.6 billion. Conversely, a depression in commercial development and a recession in housing starts quashed industry growth from the late 1980s through the early 1990s. As the demand for gypsum products slipped to about $2 billion in 1992, many wallboard contractors suffered major setbacks, but sustained growth in housing starts gave the industry a strong boost in the mid-1990s. After dropping to 1.01 million in 1991, housing starts rose to 1.45 million in 1996. Reflecting the performance of the residential construction industry in the early 2000s, the plastering, drywall, acoustical, and insulation industry performed well in the early 2000s. Although economic conditions in the United States were weak, historically low interest rates bolstered housing starts through the early 2000s. In fact, by 2003 single family housing starts had reached 1.848 million, their highest level since 1978. Although starts were expected to decline a bit in 2004, analysts believed they would remain high enough to sustain growth in many construction industries, including the plastering, drywall, acoustical, and insulation sectors. As a result, employment for this industry was expected to grow 34.3 percent between 2002 and 2012. In the late 1990s a shortage of drywall had pushed prices up substantially; at the same time, construction projects fell behind schedule, and some retail outlets limited drywall purchases to 20 sheets per customer. Drywall manufacturers responded by building new factories, re-opening facilities that had been closed, and increasing production at existing plants. Some companies hoped to import drywall from Canada, Mexico, and other foreign sources; this was a difficult proposition, though, since drywall cannot survive accidental contact with rain or other dampness and it is so brittle that it tends to break in transit. The plastering and insulation contracting business was comprised mainly of thousands of small, privately owned firms. Some of the industry leaders, however, were large contracting companies with additional operations in other segments of the construction industry. The top five firms in the plastering and insulation contracting business by revenue, as of 2003, were Rust Industrial Services Inc. of Westchester, Illinois ($750 million); APi Group Inc. of St. Paul, Minnesota ($675 million); Performance Contracting Group Inc. of Lenexa, Kansas ($509.8 million); Pacific Coast Building Products Inc. of Sacramento, California ($360 million); and Irex Corp. of Lancaster, Pennsylvania, which placed its AC and S subsidiary under Chapter 11 bankruptcy protection in 2002 due to asbestos litigation. Gowan, Matt. "Builders Expect No Supply Shortfall." The Business Journal Serving Metropolitan Kansas City, 5 May 2000. U.S. Census Bureau. 1997 Economic Census. Washington, D.C.: GPO, 2000. U.S. Department of Labor, Bureau of Labor Statistics. 2004-05 Occupational Outlook Handbook. Washington, D.C., 2004. Available from http://www.bls.gov/oco/print/ocos205.htm .